This the best of 3 worlds Lord ganesha thai amulet is combine with the power of hindu old magic world, thai old magic world and chinese feng shui world. 1) In front of this amulet, the master use tap or borrow the 8 most powerful temple energy from India to seal of this Lord Ganesha thai amulet. Shri Moreshwar or Mayureshwar Temple is situated along the Karha River in the Morgaon village in the Baramati Taluka of Pune district in Maharashtra. This region is also known as the Bhuswananda. Moregaon Village is said to have received its name as once upon a time the shape of this place was like a peacock and there was an abundance of peacock birds in this region. Literally Moregoan means ‘Village of Peacocks’ and is a combination of two words (more which means Peacock and goan which means village). As per the legend Lord Ganesh riding a peacock in the form of Mayureshwara slew the demon Sindhu in response to pleas from the Gods.This is the first Temple to be visited during the Ashtavinayaka Temple Pilgrimage. Shri Siddhivinayak Temple at Siddhatek is one of the renowned Ashta Vinayaka Temples in Maharashtra and is situated off the Pune-Solapur highway at a distance of about 200 km east of Pune. According to the Legend it is believed that it was on the Siddhtek Mountain that Lord Vishnu invoked Lord Ganesha during his battle with the demons Madhu and Kaitabha and acquired Siddhi from him. This is also said to be the place where Sage Bhrushandi and Vyas had performed penances and attained Siddhi. This GaneshTemple is on hill top facing north and built by the Peshwas. This temple is located on the banks of Bhima River in a remote little village called Siddhatek in Karjat Taluka in Ahmadnagar District. The greenery and beauty of this area does not go unnoticed to anyone visiting this place. Siddhi Vinayaka Temple of Siddhatek is the second Temple to be visited during the Ashta Vinayak Mandir Yatra. The Ballaleshwar Temple of Pali is the third Ashta Vinayak Temple to be visited while during an Ashta Vinayak Temple Yatra. This Templeis situated in the Sudhagad Taluka in Raigad District and approximately 110 kms from Pune. This is the only temple of Lord Ganesh which is famous by the name of the Ganesh devotee. The Ganesh idol of Pali is known as Ballal Vinayaka and is associated with the legend of a young lad Ballal's devotion to Lord Ganesh. This Temple is situated between the historical Sanrasgad Fort on one side and River Amba flowing on the other side. There are two lakes in front of the temple. The original Temple was a wooden temple which was renovated in 1760 to a new stone temple. One specialty of this temple is that during sunrise the rays of the sun fall directly on the Ganesh Idol. Shri Varada Vinayak Temple is the fourth GaneshaTemple to be visited during the Ashta Vinayaka Temples Pilgrimage according to Shastras.This temple is located three kilometers off the Pune-Mumbai highway near Khopoli in Mahad village of Raigarh District in Maharashtra. Varadvinayak literally means ‘the bestower of boons’. It is believed that Lord Ganesh as Varad Vinayak fulfills all the desires of his sincere devotees and also grants them boons. 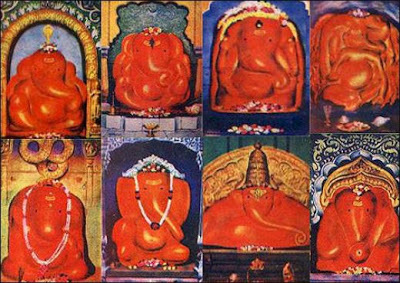 The idol of this Temple Varada Vinayak is a swayambu (self originated) and was found in the adjoining lake in an immersed position in 1690 AD. This Temple is said to be built in 1725AD by Subhedar Ramji Mahadev. The Varadvinayak shrine is associated with the legend of Prince Rukmangada, Indra and Sage Grutsamad. The temple premises are on one side of a beautiful pond. Shri Chintamani Vinayak Temple of Theur (Theyoor) in Pune District of Maharashtra is the 5thGaneshTemple to be visited during the Ashta Vinayaka Pilgrimage. In this shrine Lord Ganesh as Chintamani brings peace of mind and drives away all the perplexities. According to the Legend it is at this spot Lord Ganesha is believed to have restored the precious Chintamani jewel from the greedy Prince Guna who stole it from Sage Kapila. However the sage refused to take the gem back and began to call Lord Ganesh as Chintaamani Vinayaka. Since the incident took place under a Kadamba tree this place also came to be known as Kadambanagar. Another legend regarding this place is associated with Lord Brahma.It is said that once Lord Brahma was feeling restless and called upon Vinayaka to ease his mind. As Lord Brahma’s worries (Chinta) were removed by the Ganesha at this place Lord Ganesh came to be known here as Chintamani Vinayak. Shri Girijatmaj Vinayaka Temple of Lenyadri in Maharashtra is the sixth Ganesh Temple to be visited on the Ashta Vinayaka Mandir Pilgrimage. ‘Girijatmaj’ literally means Ganesha the son of Girija (Goddess Parvati). According to the Legend Goddess Parvati who had a strong desire to have Vinayaka as her son performed penance for 12 years in the caves of Lenyadri to fulfill her wish. Pleased by her dedication Lord Ganesha blessed her and on the day of Bhadrapada Shudh Chaturthi when Parvati was worshiping an idol of Lord Ganesha it came alive and told her that her wish has been granted. This Temple is situated at the Lenyadri Mountain in a Buddhist Cave which is around 95 Kms from Pune. Lenyadri is in North of the Pune City on the banks of River Kukdi. The beauty and pollution free environment of this area does not go unnoticed to anyone visiting the Shrine. There is an entrance fee of Rs 5 for visiting this Temple. Shri Vigneshwara Temple of Ozar is the 7thTemple to be visited during the Ashta Vinayaka Temple Pilgrimage. This AshtaVinayakaTemple is in the banks of Kukadi River which is in Junnar District and around 85 kms from Pune. The Deity of this shrine is known as Vigneshwara which means ‘remover of all obstacles’. It is believed that after visiting this place God takes away all your problems. As per the Legend a demon by name Vignasura was troubling the Sages. Responding to the prayers of the Sages Lord Ganesh fought with the Demon Vignasura who surrendered to Ganesha and agreed to stop his misdeeds. In connection with the surrender of Vignasura the Sages installed an image of Vigneshwara at Ozar on Ganesh Chaturti day and offered worship. Shri Mahaganapati Temple of Ranjangoan is the eight and last GaneshTemple to be visited during the Ashta Vinayaka Temple Pilgrimage. According to the Legend it is said that it is at this place Lord Shiva invoked Ganesha before fighting the Demon Tripurasura. Therefore the Ganesha idol of this Temple is also known as Tripurarivade Mahaganpati. The Mahaganapati Temple is east facing and has a huge and beautiful entrance gate. The Idols of Jay and Vijay are present near the gateway. The temple is constructed in such a manner that the rays of the sun fall directly on the idol. Lastly, the master use a very powerful yantra on behind to seal up the power inside.